YouTube (s GOOG) in 2011 is a very different beast from its early days as a depository for funny cat videos and video blogs. Now that the site has fully committed to bringing professional-grade content to its audience with one hundred original channels, the amateur clips are starting to look out of place. 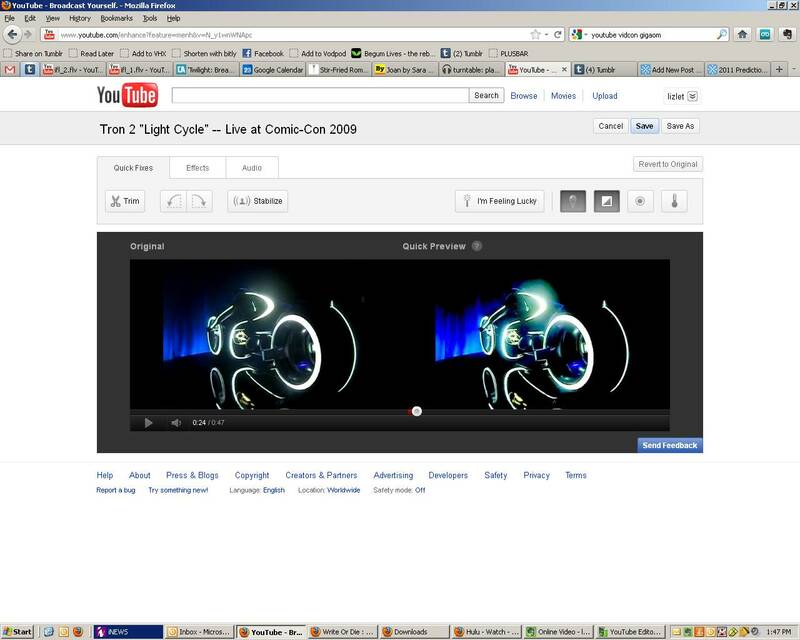 But of the many initiatives that YouTube has implemented to raise the bar for videos on its site, one of the most directly accessible is the YouTube editor, which was launched last year and allows those without access to programs like iMovie or Final Cut Pro the ability to edit videos before posting. As YouTube has evolved, so has the YouTube editor: Nine weeks ago, the Edit Video feature was launched, allowing users to modify already-posted videos without having to re-upload their videos or change the URL. It’s a game-changer for any frequent YouTube user — and since this feature has been enabled, four million videos have been enhanced by two million unique users, according to YouTube product manager Jason Toff. The YouTube editor is deliberately designed to make it easy for users lacking editing experience to improve their videos — in fact, features were stripped out during user testing to to keep things from being too confusing, Toff told us. “There are a handful of tools everyone uses — as you add more buttons, people found it to be less easy to use,” Toff said via phone. Central to the Edit Video feature is the Google-y named “I’m Feeling Lucky” button, which when activated identifies and adjusts stabilization, brightness and color correction issues within a video. While it’s possible to make these fixes manually within the Edit Video feature, those changes apply across an entire clip. “I’m Feeling Lucky,” meanwhile, can make dynamic adjustments within the clip, so if a clip starts off too bright and then gets too dark, both issues would be addressed. Like the “I’m Feeling Lucky” button on the Google home page, this feature isn’t infallible, especially on footage filmed in dark rooms. But according to Toff, “if it works, it works amazingly well” — and if it doesn’t work, it can be deactivated with one click. The “I’m Feeling Lucky” button was not the brainchild of a Google employee, but was instead a project developed by YouTube summer intern Timothy Wong, a computer science student at Stanford University. The challenge he was given, according to Toff, was to “find a way to make videos better just by pressing a button.” Wong completed the challenge in less than two months, with the feature launching just as his internship reached an end.